Helllooo winter!!! It's officially bitter cold here in the Midwest! And when the winds start to howl, what better way to warm up than with a hot bowl of savory butternut squash soup? This decadent soup will warm up every bone in your body! My Mom was especially happy when I developed this recipe! She absolutely loves soup and had been requesting I create a butternut squash soup that was more savory than sweet. 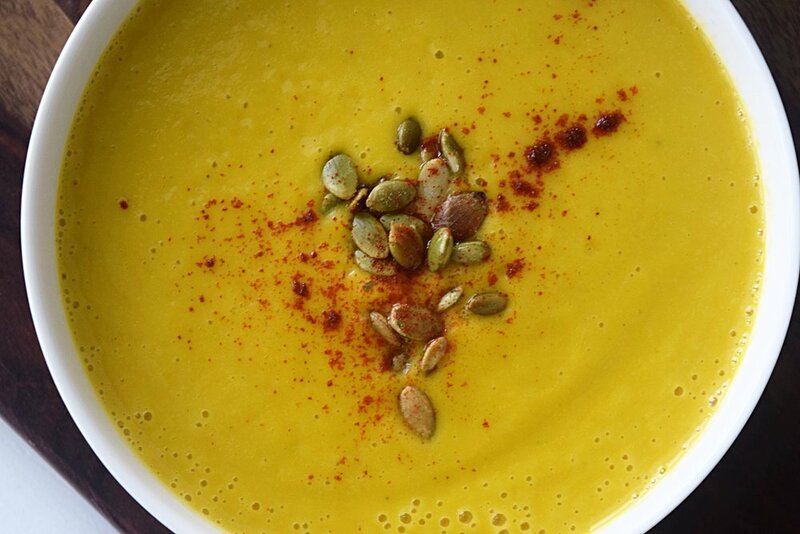 This soup is a perfect blend of subtly sweet squash and a savory blend of herbs. I added coconut milk to give the soup a smooth texture and a luxurious mouth feel. Butternut squash is great to eat in winter to help keep your immune system strong! Not only is it rich in vitamin C and other nutrients, one cup of cubed butternut squash provides 582 mg of potassium, more than the amount available in a banana. This soup is the perfect start to a meal or add a green salad with a fresh loaf of whole grain bread and you have a complete dinner! Enjoy!! Heat oil in a large saucepan. Add onion and celery and cook until softened. Add garlic and squash and cook until garlic is aromatic. Add pears, herbs and spices and cook for two minutes. Add vegetable stock to cover squash and bring to a boil. Simmer for 20 minutes until squash is soft. Carefully remove pan from stove and use an immersion blender to blend until smooth. You can also do this in two batches in a blender. Add in coconut milk and serve with a pinch of pumpkin seeds and smoked paprika! Fast, simple and fresh is the name of the game with this delicious and filling pasta dish. Any recipe that I can make in under 30 minutes and packs a flavor punch is a winner with me! 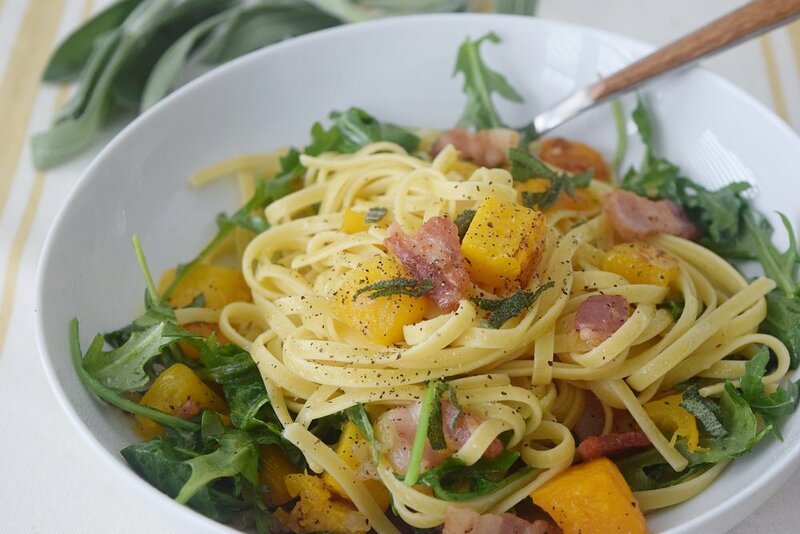 The salty bacon, sweet butternut squash and spicy arugula combine against a background of perfectly cooked linguine. Not having a heavy cream sauce or tomato sauce keeps this dish light and reduces the calories. Using a small amount of bacon adds all the flavor you will need for the pasta! To get this done in 30 minutes make sure you buy butternut squash that is already diced. You can find it in the produce section of your grocery store by the fresh herbs. This will save you so much time and make this dish a snap! One final cooking tip with your pasta, make sure you use a large pot of salted boiling water. Don’t break your pasta in half to fit it in a small pot as this makes for awkward pieces to fit on a fork. Just drop that pasta in and it will cook down into the water! Preheat oven to 425 degrees. Place cubed squash on a baking sheet and drizzle with 1 tablespoon olive oil and a sprinkle of salt and pepper. Roast for 15 minutes until just tender. While the squash is cooking, bring a large pot of salted water to a boil and add linguine. Cook pasta for 9-10 minutes and drain. Place in a large serving bowl. In a large skillet, cook bacon until almost crispy. Remove half the fat from the pan and add the shallots. Cook until shallots are tender. To the skillet add sage, arugula and roasted squash. Stir and cook over very low heat just until arugula starts to wilt and pour squash mixture over the serving bowl of linguine. Toss to combine and finish with Parmesan cheese if desired. Divide among plates and serve. A good meal prep recipe is something to hold on to! Once I find that perfect combination of flavor and minimal cook time, that meal tends to be on repeat in my house. This recipe fits that description perfectly! Tender chicken thighs and savory vegetables make the perfect dinner or lunch to eat all week. It takes minimal time to pull everything together and chop your veggies. The majority of the recipe is the time for the whole thing to roast in the oven! While the veggies and chicken are cooking, you can be prepping breakfasts, lunches and snacks! I love this recipe because it is so versatile, you can add your own favorite seasoning or even swap out your vegetables for what you have on hand. I like to serve this dish with brown rice if I need to replenish my carbs. In my recipe, I have you use bone-in with skin-on chicken thighs. I don’t use them all the time as they are higher in fat than a chicken breast, but I do appreciate the juicy meat and crispy skin that these thighs have! You can also use chicken breasts or boneless, skinless chicken thighs as well. If you do use either of those, you can skip the searing step in the recipe and put your meat right on to the sheet pan with your vegetables! Preheat oven to 425 degrees. In a large skillet, heat olive oil to a medium heat. Salt and pepper to taste and place chicken thighs skin down in skillet. Sear chicken until skin is brown and crispy. Remove chicken from skillet and place skin side up on a large baking sheet or roasting pan. Add remaining veggies and garlic to the sheet pan and drizzle with more olive oil. Season with salt and pepper. Place veggies and chicken in the oven and bake for 20 minutes until chicken is cooked through (165 degrees) and vegetables are tender. Remove from oven and drizzle with balsamic vinegar and top with fresh herbs.